The price is for the code license option. Please contact for other options. 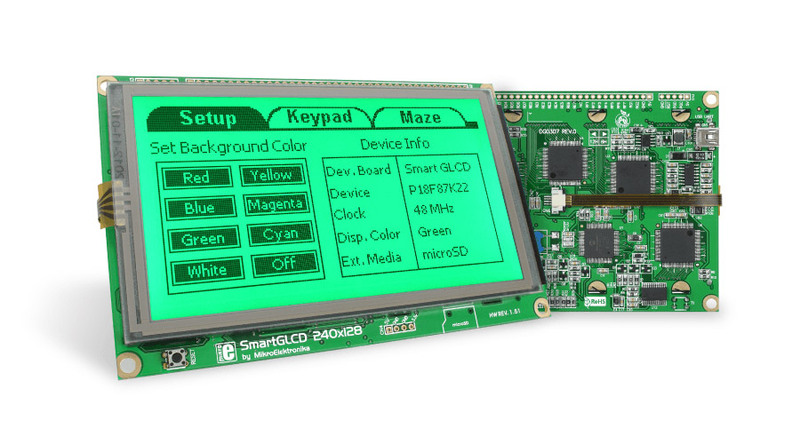 Visual GLCD is a standalone application used for rapid development of graphical user interfaces for graphic LCD. The software generates code compatible with MikroElektronika compilers, for the following architectures: PIC, dsPIC, PIC32, ARM and AVR. The software also implements an intuitive environment and many drag-n-drop components which can be used for building applications quickly. It’s easy to love Visual GLCD! Pay once and never worry about it again. Once you buy Visual GLCD you are entitled to a lifetime of free upgrades. Upgrading the software takes only a few minutes and a few clicks. We are constantly adding new features, and you can keep track of what is happening on the Software Roadmap page. The support team is always available – you can rely on our help while you are developing. The software license guarantees free product lifetime technical support. Do you need more space for your images and fonts? Do you want to create image slideshows, or to even play a video from MMC/SD Card? With new Resource file feature, Visual TFT software brings you all this and much more. If this option is selected, after code generation, Visual TFT will store all of your images and fonts in the resource file and will optimize them as much as possible for faster utilization. You just have to copy that file onto your MMC/SD card and you are ready to go. Buy the Visual TFT and the License Code will be sent to your inbox instantly. Once you activate the license you can use it on up to two computers. Own, manage and deploy multiple software licenses. Instead of buying several licenses at a regular price, use the Site License option and get licenses for your whole team or class at a special price.